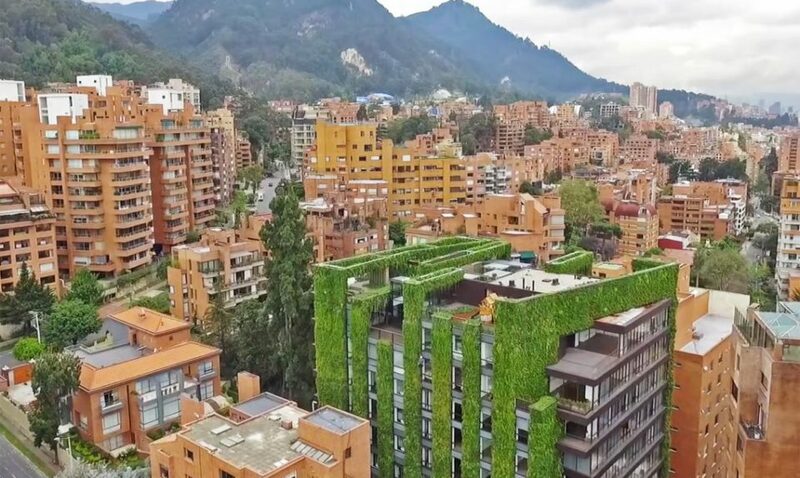 An extensive living facade system in Bogota, Columbia, represents growth in the right direction, away from unrealistic tree-covered skyscrapers toward more sustainable and useful vertical greenery. 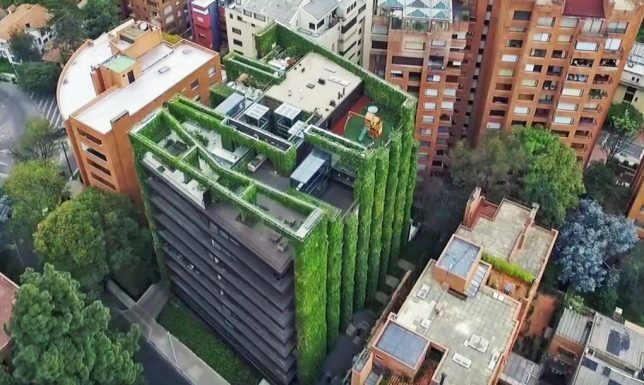 The Santalaia building has plants spanning over 30,000 square meters of its surface area, able to produce oxygen for over 3,000 people annually (and filter tons of heavy metals, harmful gases and other airborne particulates). Paisajismo Urbano installed this specific system, developed by Ignacio Solano. 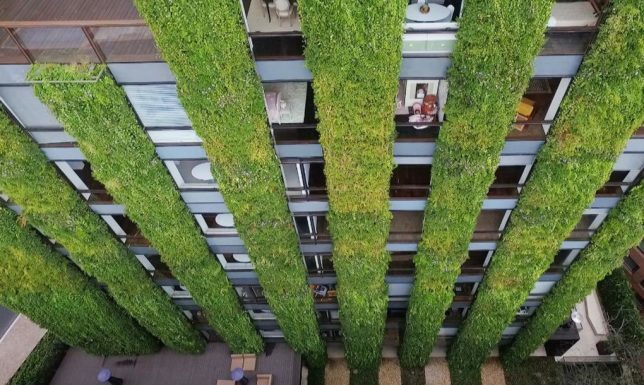 The recent trend (in renderings and to some extent reality) of putting trees onto tall towers is problematic from engineering and ecological standpoints. “Intensive” greenery requires thicker layers of soil and more complex systems for watering, maintenance and structural support. 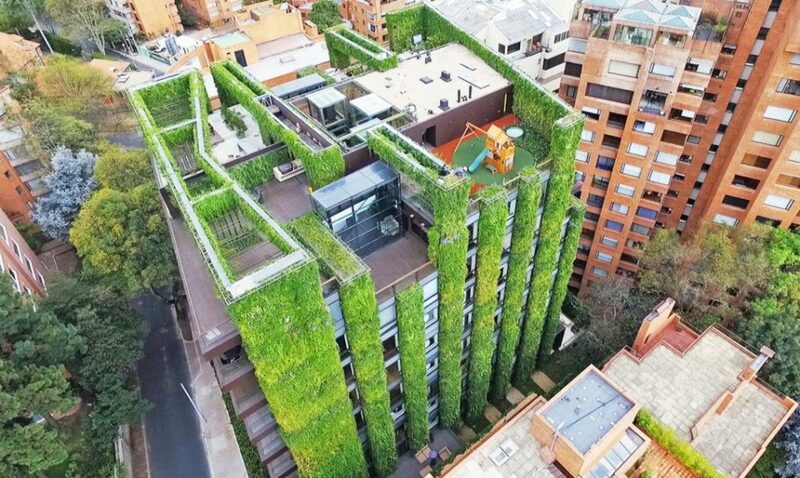 “Extensive” greenery, by contrast, provides many of the same benefits with lower cost and less wasted energy. Many architects are naturally tempted to place trees on buildings, which do have a few functional advantages (like providing shade and making for nice-looking renderings). Still, building residents as well as the public would be better served in most cases by systems like this one. 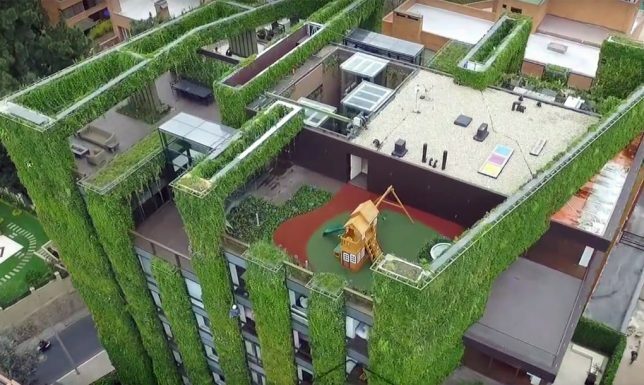 Even then, it is important to determine in advance what the goals and intended benefits are, since any green installation is complex and requires ongoing support.